The fundamental factor in science research is in measuring data. Technology has significantly evolved the measuring process. The more data that can be measured, the more insights and observation can be gathered. Most measurement devices are electronic in nature. Some use light, some heat, and others use nanotechnology. 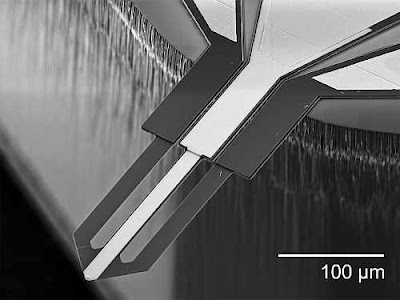 Atomic force microscope cantilever tips with integrated heaters are widely used to characterize polymer films in electronics and optical devices, pharmaceuticals, paints, and coatings. These heated tips are also used in research labs to explore new ideas in nanolithography and data storage, and to study fundamentals of nanometer-scale heat flow. Until now, however, no one has used a heated nano-tip for electronic measurements. "We have developed a new kind of electro-thermal nanoprobe," according to William King, a College of Engineering Bliss Professor in the Department of Mechanical Science and Engineering at the University of Illinois at Urbana-Champaign. "Our electro-thermal nanoprobe can independently control voltage and temperature at a nanometer-scale point contact. It can also measure the temperature-dependent voltage at a nanometer-scale point contact." "Our goal is to perform electro-thermal measurements at the nanometer scale," according to Patrick Fletcher, first author of the paper, "Thermoelectric voltage at a nanometer-scale heated tip point contact," published in the journal Nanotechnology. "Our electro-thermal nanoprobe can be used to measure the nanometer-scale properties of materials such as semiconductors, thermoelectrics, and ferroelectrics." The electro-thermal probes are different than thermal nanoprobes typically used in King's group and elsewhere. They have three electrical paths to the cantilever tip. Two of the paths carry heating current, while the third allows the nanometer-scale electrical measurement. The two electrical paths are separated by a diode junction fabricated into the tip. While the cantilever design is complex, the probes can be used in any atomic force microscope. In addition to Fletcher, co-authors of the paper include Byeonghee Lee, and William King. The research was performed in the Nanoengineering laboratory as well as the Micro and Nanotechnology Laboratory and the Materials Research Laboratory at the University of Illinois. The research was sponsored by the Office of Naval Research and the Air Force Office of Scientific Research.